We had the previous two Monday's off from school, and it was quite difficult for me to wake up this morning wishing that today is a holiday as well. One of our occasional tropical storms was approaching and it was rather stormy the mornings when I made these couple of Minion themed lunches several weeks ago. The first one was of bread and the other one pasta. Bento lunch 1: This Minion was free hand cut out of bread, its basic shape was rather easy to make. I made the goggles, grin, and hair from organic fruit leather, the circles for the goggles, which were made with a cutter, were stacked to give the proper depth and the rest was free hand cut. His sides were orange slices, seedless red grapes and crinkle cut cucumber slices. Far right is a cloth napkin. 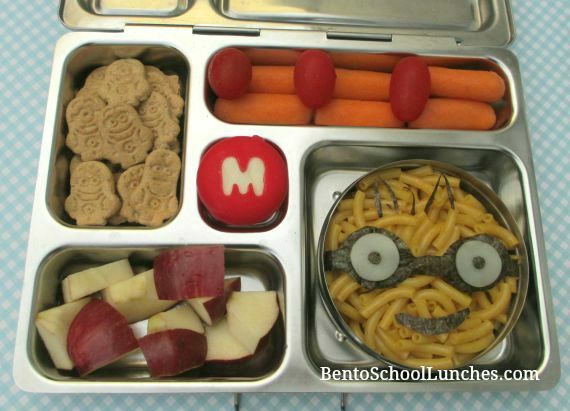 This lunch was packed in his bentology bento box. Bento lunch 2: This Minion face was made from Annie's organic pasta with nori goggles, hair, and smile with mozzarella cheese and nori eyes all of which were freehand cut. Alongside he had organic apple pieces, Despicable me honey grahams, babybel cheese with the letter M cutout using my alphabet cookie cutter, organic baby carrots and grape tomatoes. This lunch was packed in a Planetbox rover. 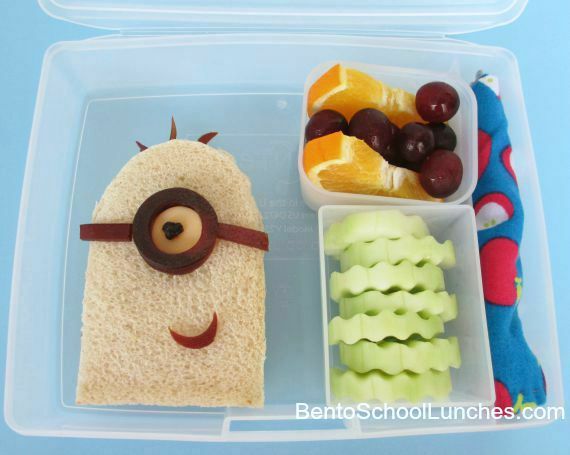 Both these Minions lunches are so cute! The pasta look so yummy! Both versions are so cute!